28 years, 8 months, 28 days old age. Yuzvendra Chahal will turn 29 on 23 July, 2019. Only 3 months, 2 days, 22 hours, 7 minutes has left for his next birthday. Yuzvendra Chahal has celebrated the total number of 28 birthdays till date. See the analysis by days count and bar graph. 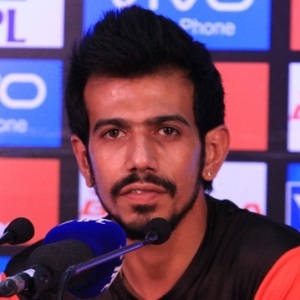 Yuzvendra Chahal was born on 23-07-1990 in Jind in the state of Haryana, India. He is an Indian Cricket Player & Chess Player. Yuzvendra Chahal is an Indian leg-spinner who catapulted to limelight after he scalped 34 wickets in the National Under-19 event of Cooch Behar Trophy in the year 2009. He was the leading wicket-taker of the tournament. His first love though was Chess and has also represented India at junior levels but because he couldn’t find himself a sponsor, he quit playing chess and made his first-class cricket debut by playing for Haryana and in 2011 IPL squad he was bought by the IPL side Mumbai Indians but couldn’t get a single game. But he finally got his chances at the Champions League T20 that year. He performed well in all the matches but he was instrumental in Mumbai winning the final as he ended his spell with the figures of 3-0-9-2. He was retained by the franchise but could only get to play in one match for the next two years. He was bought by IPL franchise RCB in 2015 IPL auctions and it is there where he found success and attention. He was not just their highest wicket-taker for next two years but was also among their biggest match winners with the ball. With some fine IPL and domestic performance, he forced his way into the national set-up and got the opportunity to feature in T20Is and ODIs on the tour of Zimbabwe in 2016. After which, Chahal was not picked for any further series until the T20I series against England in 2017. In the decider match of the series, he delivered the best spell of his career by picking up 6 for 25. After missing out on selection for the champions trophy, he has made his berth fixed in the national squad in the limited overs format. He performed well in the home season of 2017 against Australia and New Zealand. He made every opportunity count and if he keeps bowling the way he is bowling in the away series next year then he will be Virat's go to man in the 2019 World Cup. He was born to an Advocate K. K. Chahal and a homemaker Sunita Devi & has two elder sisters. His sisters living in Australia. He is in a relationship with film actress/model Tanishka Kapoor. Yuzvendra Chahal, who represents Haryana in Ranji Trophy, is the only player to represent India in chess and cricket. In 2002, Chahal was U-12 national chess champion. He has represented India at the Asian Youth Championship (U-12 category) in Kozhikode and U-16 India at the World Youth Chess Championship in Greece. He is still listed on FIDE’s (Fédération Internationale des Échecs/ World Chess Federation) official site. As per latest FIDE ratings, Chahal’s rating is 1956. Yuzvendra Chahal had full support from his family but he had to change his focus from cricket to chess as he could not find a sponsor for himself. Apart from cricket and chess, Chahal also has an interest in football. He is a Real Madrid supporter and his favorite footballer is Cristiano Ronaldo. A complete child at heart, Chahal is a self-acclaimed prankster. He is mischievous, jokes a lot and likes to keep the atmosphere light. Chahal has a huge crush on Katrina Kaif. He drools over her smile and says that she is his dream date! Initially, Chahal used to be a medium pacer but later on he shifted his focus to leg spin and has mastered the art.